What is a PVD ? 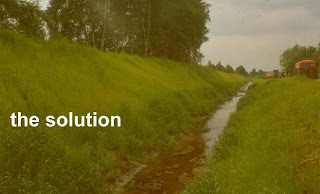 Used for soil consolidation, settlement instead of sand drains. 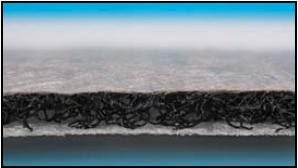 The geotextile jacket type can differ depending on the producer. There are also many core types in the market. Instead of using traditional (mineral) products if we use geosynthetics materials for the capping of waste disposal areas we may have extra storage. So, to use geosynthetics has economic advantages against the traditional products. 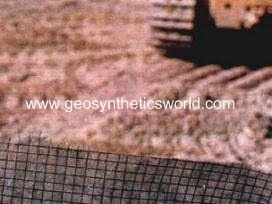 Also it is more easy to use geosynthetics (geotextiles, geomembranes, geogrids, geocomposites, geomats). 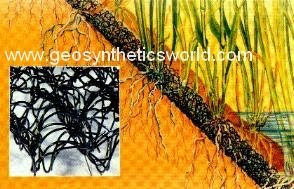 On the picture above you can see a simple comparison of “traditional” mineral- and “geosynthetic” capping of landfills. As seen the mineral seal and drainage section have much thickness than the geosynthetics drainage and geomembrane seals. 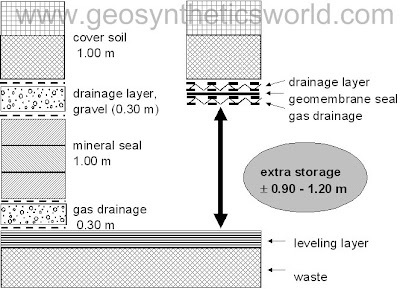 Geocomposite drainage materials are used both for gas and water drainage. Another use of synthetics 3 dimensional mats. 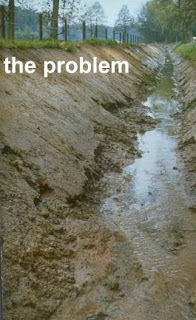 ExSpray is a rain water spray absorbing matting at the inside of mud flaps of trucks and busses. The open structure of the matting "catches" 80% of the rain drops, before spraying out adjacent to the truck. Consequently the rain water spraying effect of the tires is minimized significantly. This results in good view for the cars driving adjacent to the truck or bus. This pictures shows layers of a typical waste disposal area. Some detailled information about waste capping will be sent in next posts. An assessment of the effect of vertical drains on the consolidation process may be made using the method proposed by Kjellman. that the permeability of the cohesive soil remains unchanged throughout the consolidation period and that the internal resistance of the drain is negligible. Practical experiments have shown that although these assumptions are not always applicable, in majority of cases their influence on the ultimate results is of little significance. The exception is where drains without a "high flow" core are used for thick highly compressible strata. In such cases the internal resistance of the drain can have a substantial effect on the consolidation period. The project contains the foundation of 4 silos with a diameter of 27 m each, to be used for the storage of grain. The soil had insufficient bearing capacity to prevent differential settlements under the circular loaded area. The steel wall of the silo was placed upon a concrete foundation. The bottom of the silo consists of a circular concrete plate which is not connected to the surrounding foundation of the wall. When the silo is filled, this could bring about some movement of the plate caused by the consolidation of the subgrade. A local designer made a design with four layers of Enkagrid TRC-20 geogrid to improve the bearing capacity of the foundation underneath the silos. TRC-Grid reinforces the granular fill and prevents mixing of the particles of the subgrade and the granular fill during the design life. Furthermore TRC-Grid acts as a filter around the drainage pipe. Differential settlements can occur due to consolidation or loss of bearing capacity of the underlying subsoil between the silo wall and the silo bottom plate. However, the support and the movement of the silo bottom plate should be uniform. Kocaeli free zone project has a harbour inside the project. There is a heavy traffic of trucks. To prevent or reduce partial settlements on the roads due to the heavy truck traffic special geogrid was used. This multifunctional geogrid delivers reinforcement, separation and filtration in one easy-install product for paved roads, parking areas, platforms and building/structure foundations. In the project it reduced the required subbase thickness. Due to the special manufacturing method Enkagrid TRC has very low elongation properties. It helps to reduce the partial settlements. Beside the reinforcing Trc geogrid also provides a filter layer. 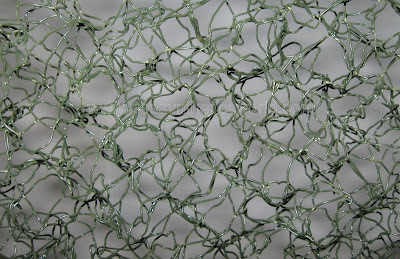 So it works like a geogrid and a nonwoven . This type of geogrids work as reinforcement, separation and filtration layers. In controlling water movement, back splash, and noise in commercial fountains and water displays you may need a material to reduce the sound. Three dimensional products which can control these , can be used used in theme parks, shopping malls, restaurants, museum exhibits etc.